Garages are pretty much every homeowner’s dark spot. They are often crammed with too many things. Some people might even struggle to find enough space to keep their cars in. Seeing how the garage can be used to store so many different things such as tools of all shapes and sizes, bikes, and other massive clutter, it’s easy to understand how this can quickly turn into a problem. With that said, the garage will require a bit more attention and craftiness when it comes to storage solutions. Knowing this, trying to organize one’s garage can be very intimidating and can even be the stuff of nightmares for some people. However, ignoring the issue won’t make it magically go away. You’ll need to come up with something as soon as possible. Don’t worry though, as the market is full of great storage options that should cover most of your needs. In this article, we’ll be focusing on overhead garage storage which can help you get rid of some of the things that might be lying on the ground, blocking the way, and, in some cases, even posing a potential danger. In this list, we have gathered some of the best overhead garage storage solutions available on the market, and we’ll be reviewing them in order to help you figure out how to get rid of the extra clutter that’s plaguing your garage. The FLEXIMOUNT overhead garage storage is an excellent choice for those who are looking for something that can provide a lot of overhead storage space. Offering 105 cubic feet in storage capability, this product is sure to please a lot of people as it should be big enough to fit most, if not all, of your items with ease. It is also very durable and reliable. Don’t worry about this rack falling anytime soon as it was built to withstand whatever you throw on it. Not only that, but the installation process is rather simple, and there is even a YouTube video that shows you how to install it properly, so you don’t have to waste time trying to figure out how to set it up. The FLEXIMOUNT overhead garage storage can withstand upwards of 550 pounds of weight. You have a choice to either use it with an angled roof or a flat one. One of its more prevalent strengths is, as we mentioned before, how easy it is to install. It’s incredibly user-friendly and even has a sturdy support bar that prevents any sagging that might happen in the center of the rack. Check out the video below which shows you exactly how easy it is to install this excellent storage rack. Simply put, the FLEXIMOUNT overhead garage storage offers the best of both worlds by being large enough to hold most, if not all, of your items while also being very reliable and durable. It’s also very user-friendly and will save you the time and trouble of trying to figure out how to set it up. Even though it might appear to be more expensive than the previous one on this list, the higher price can be justified by the difference in the material from which it is made. 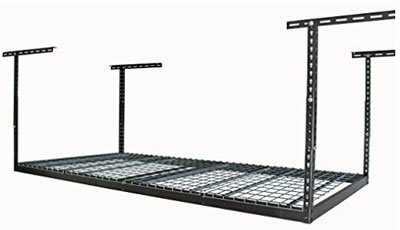 This MonsterRax overhead garage storage rack is made from one of the best materials available on the market which meant that its durability and reliability are nearly unrivaled. This clearly shows in its impressive 600-pound carrying capacity. It also has a support center that is intended to help you fix the rack to your garage ceiling. The MonsterRax overhead garage storage is meant to offer the same level of strength as an industrial rack which is rather impressive. Another thing that’s unique to this storage rack is the fact that you can adjust the height of the storage. This means that you can alter it to your preferences. This is an outstanding feature as it gives the MonsterRax storage rack an edge over its competitors. Aside from its practicality, this storage rack’s simple, yet elegant look will fit in perfect no matter where you put it. With that said, the installation process is not as simple as the FLEXIMOUNT overhead garage storage, as there is no online guide. However, if you start having difficulties in the installation process or just don’t want to bother with it, then you can pay a small extra fee and the installation will be made for you. One caveat we have with this storage rack is the fact that it doesn’t come with any spare washers and nuts. With that said, it isn’t necessarily a bad thing as it can actually help you keep track of the exact amount needed for the system to fit the ceiling. Another thing that some people might not like is the price, but that’s not that big of a deal. 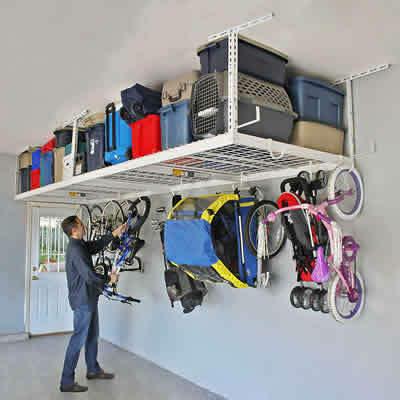 Simply put, the MonsterRax overhead garage storage rack is both practical and elegant. It can hold a whopping 600 pounds, and you can even customize the height of the storage so you can fit whatever you need in there with no issues. This unique feature, along with the high storage capacity, makes it a great storage solution. SafeRacks are a well-known brand that has a good reputation. You can tell that they have good, long-lasting products by the fact that they offer a lifetime warranty. This system is able to hold 500 pounds of weight, and while it is less than both of the products previously listed, it has an adjustable drop length which is somewhat useful. Another great thing about this system is the fact that you don’t have to worry about setting it up if you don’t have a level ceiling as you can make a couple of adjustments to make it fit regardless of what type of roof you might have. You also have several options when installing this rack, you can easily set it up perpendicular or parallel to the joints with ease. For a product that is durable, customizable, and offers a full lifetime warranty, you’ll be getting your money’s worth and more by getting the SafeRacks 3×8 overhead garage storage rack. All in all, the SafeRacks 3×8 Overhead Garage Storage rack should be big enough to fit most bikes as well as withstand their weight. The customizability feature is a welcome one indeed. The fact that you can install it on any type of ceiling is also very handy. 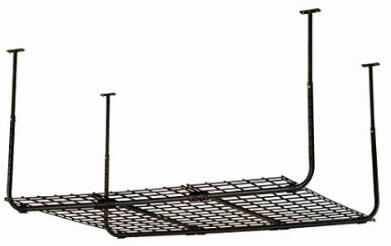 And most of all, this overhead garage storage rack has an excellent price! If you are running a tight budget, it can be tough to trust a cheap overhead garage storage rack. However, the HyLoft 50175-10 60-Inch by 45-Inch Pro Ceiling Mount Shelf is made specifically for those who don’t have much to spare in the way of an overhead garage storage rack but also want something that is reliable. While being smaller than the other storage solutions we mentioned, this storage rack is perfect for those who don’t have an egregious amount of clutter lying around. The 35 cubic feet of space it offers should suffice most people. Additionally, it has a weight limit of 300 pounds, which might seem unremarkable at first glance, but if you take a look at the price of this thing, you’ll be surprised at how much value you’re getting with it. You’ll also be pleasantly surprised to hear that it has the option of adjusting the height of the rack. This means that you don’t necessarily need a ladder to access what you have stored on it. Also note that when you buy this, you’ll also get everything you need to set it up, which is neat. You don’t have to worry about it falling anytime soon either. However, it is recommended that you evenly distribute the weight of what you’re storing on it instead of putting it all in one spot. 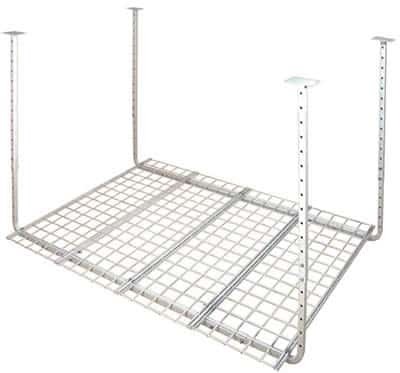 And lastly, the HyLoft 50175-10 60-Inch by 45-Inch Pro Ceiling Mount Shelf can be modified to your heart’s content, you can even use Hyloft hooks with it, and the product itself comes with zip ties which you can use to connect it to other units you might have in your garage. The main selling point of the HyLoft 50175-10 60-Inch by 45-Inch Pro Ceiling Mount Shelf is its low price and excellent value. In addition to that, it offers a bevy of useful features, mainly the fact that it’s user-friendly, and is highly modifiable. Last but not least, if you thought the HyLoft 50175-10 60-Inch by 45-Inch Pro Ceiling Mount Shelf’s price was very cheap, then you should take a gander at this one. The Suncast Ceiling Storage is the most affordable option on the market that is sturdy enough and worthy of your money. Although it might seem small and unremarkable, it’s mainly meant to be used for light and small storage. It has an adjustable height of 16 to 27 inches and can hold up to 250 pounds. You can use it on the ceiling or drywall with a wood stool and will do its job admirably. The Suncast Ceiling Storage is also user-friendly, as the installation process is rather simple and quick. This is mostly thanks to the fact that the poles aren’t just welded brackets. There are instructions that you can follow to set it easily, you don’t have to be a DIY enthusiast to do it. Being one of the cheapest storage solutions on the market, the Suncast Ceiling Storage is surprisingly effective and offers fantastic value. It is perfect for storing smaller things, and with its sturdy and strong hold, it’s built to last long. The ease of installation is like the cherry on top. We hope that you found this article helpful. Again, the products you should go with will eventually come down to what you need to store. If you’re running a tight budget, the Hyloft and Suncast storage solutions are perfect for storing small to medium sized things. However, if you have more money to spare, then you can go with the three first options which are all equally terrific and a wise investment overall.